Today I’m dedicating these photos of an orchid I gave to my mother for Mother’s Day two years ago - it’s currently blooming for the first time since I gave it to her, which is exciting to see! It desperately needs to be repotted, but that has to wait until the blooms have fallen, and Spring is well underway. As a result, it’s not the healthiest, and actually had one bloom fall before it had a chance to open; hopefully it will thrive better in a new pot, although it may be another two years before you see blooms again, since it’s taken two years for it to bounce back from the last repotting (my bonsai took a whole year; I guess orchids are even slower!). Heading to the DC Big Flea tomorrow? Kick off your weekend with some Fredericksburg antique shop finds from last weekend! I didn’t pick anything up this time, but window shopping in antique shops is exciting to me enough on its own, plus I discovered a new favorite singer in one of the stores, so I have new albums I’m eating up as a result. Always bring home memories, even if they’re not physical. Lately I’ve been slowly working my way through unedited personal sets in my photo library. 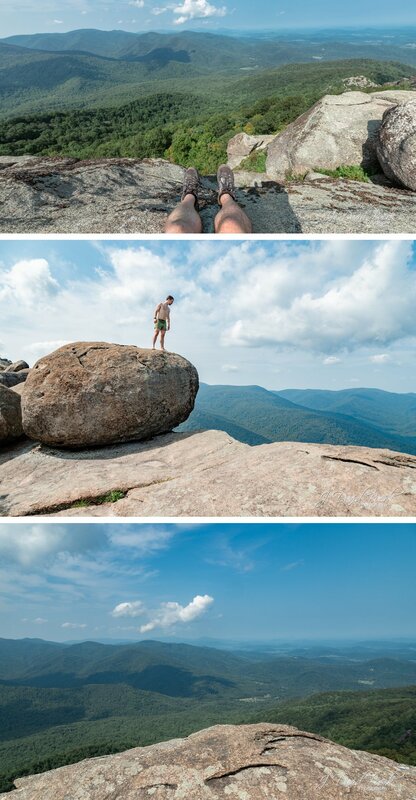 This week’s offering is from last Summer, when I finally got to hike Old Rag once again. After my Spring, 2017 knee mishap which led to surgery and a long recovery in PT, this was my first time hiking Old Rag since making a full recovery. My friend Patrick, who you may recognize from many of my car posts, and I hit the trail on a steamy August mid-morning. I’d come to find out later that day there were other people I know on the mountain at the same time we were, but we simply never crossed paths; funny how that works sometimes. Old Rag is the tallest peak in Shenandoah National Park, and naturally provides some of the most incredible panoramic views of the Shenandoah Valley. 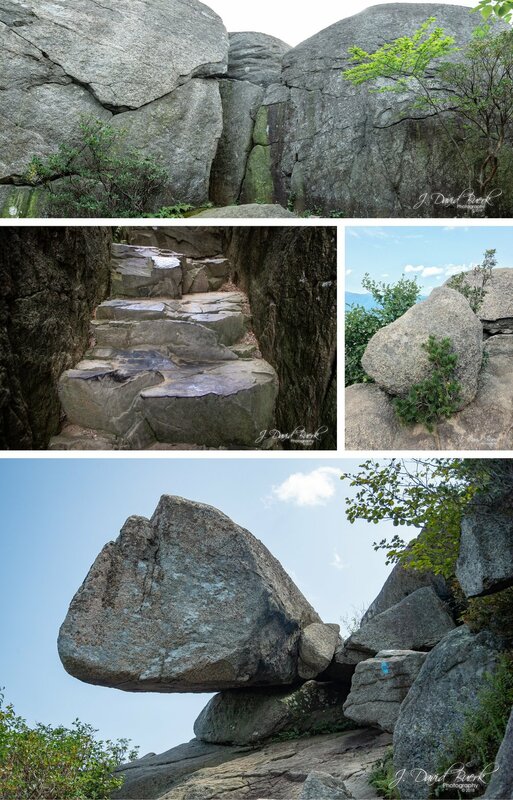 It is known for its extensive granite rock scrambles along the trail with some locations along the trail and at the summit offering opportunities for bouldering or full-on rock climbing for those feeling more daring. All photos in this post are available for print here. If you’re unfamiliar, parts of the trail run through and under the massive granite boulders; here, the trail proceeds up a natural staircase inside the opening between the rocks, in the center of the frame below. As you ascend and eventually descend the mountain, you can changes in foliage, ground composition, and wildlife. 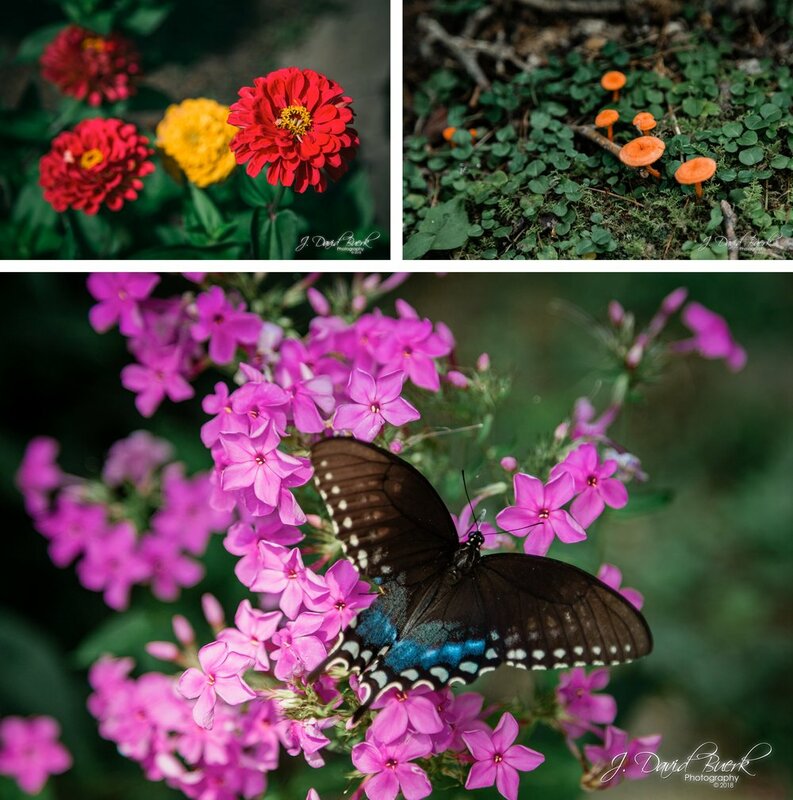 Hello photography friends, I just wanted to take a moment to reiterate that all official communications with J. David Buerk - Photography are through myself (David; hi! ), and only through my official contact channels and social media profiles. If you encounter any profile that you are unsure or suspicious of, claiming to be me, or conducting business on my behalf, immediately cease communications and please report any suspicious behavior like this to my email, david@jdbphoto.com. Although I haven’t received any reports of impersonation, I was recently contacted on one of my official social media profiles by a new, blank profile bearing my name, asking for basic information, which is why I am disseminating this cautionary message. NOTE: My old domain (jdbphoto.com) redirects to this site. NOTE: My old email (david@jdbphoto.com) still works! In fact, both emails are the exact same account and inbox. I also accept PGP encrypted email; ask for my key. NOTE: This URL was changed to mirror my other social media URLS on March 5th, 2019; the old URL (facebook.com/jdbphoto) does not work anymore, as Facebook does not allow masks or redirects. NOTE: Not regularly monitored; please direct messages to david@jdbphoto.com. NOTE: Google+ is shutting down April 2nd, 2019; read why here. NOTE: I am not presently active on Snapchat; this profile is not regularly monitored for snaps / messages - please direct all communication to the above email / phone number / social media profiles instead, but feel free to follow in the event I do begin using this profile. I also have personal accounts at many of the services above, and others not listed; I do not use my personal accounts for business purposes, and if I am contacted for business on one of my personal accounts, I will always direct you toward my email, phone number, website, and / or social media profiles listed above. If you encounter an account seemingly impersonating me, either a personal or business account, or to conduct business or not, please notify me immediately. Old Rag Mountain, August, 2018. Finally, a thank you to every one of you who follows my photography, shares my enthusiasm, and introduces me to new people who will enjoy my work for years to come. Without you my work would be much less vibrant and diverse, and I appreciate your diligence in ensuring security and authenticity. This February brought another travel photo assignment; my third assignment in Chicago. Some extraordinary circumstances were leading up to my travels this time around; namely, the 35 day long government shutdown, and the January–February 2019 North American cold wave which sent the Polar Vortex plunging into the midwest - both were impacting air-travel in the weeks preceding my scheduled trip to one of the cities most severely impacted by these events. Both the government shutdown and polar vortex ended the same week, just one week prior to my travel dates. Because of the government shutdown, I wasn’t able to complete my interview for Global Entry (and more importantly to me, TSA Pre✓; the real goal since I’m currently only flying domestic, and have been well-versed in air-travel since 2005), despite having my pre-clearance for a while. I actually still haven’t my interview yet because I’ve been anticipating another government shutdown on February 15th (although today’s news indicates another shutdown may be averted). Seeing the images out of Chicago during the worst of the Polar Vortex, I was glad to be home during the fierce cold, which at its worst reached a wind chill in the -50ºFs… but a tiny part of me wished I was there to witness temperatures colder than the Arctic. As always, I schedule my travel days to be as relaxing as possible - the goal is to get there and get settled, along with some good food. In fact I have the IAD - ORD - IAD route down to a science now, taking the exact same departure and return flights, and staying at the same business hotel in nearby Rosemont. The next morning was my scheduled photoshoot. Unfortunately, due to a paperwork technicality beyond my control, the photoshoot wasn’t able to happen; I’ll have to reschedule for next month. Sometimes things just don’t work out as planned; all you can do is your best. 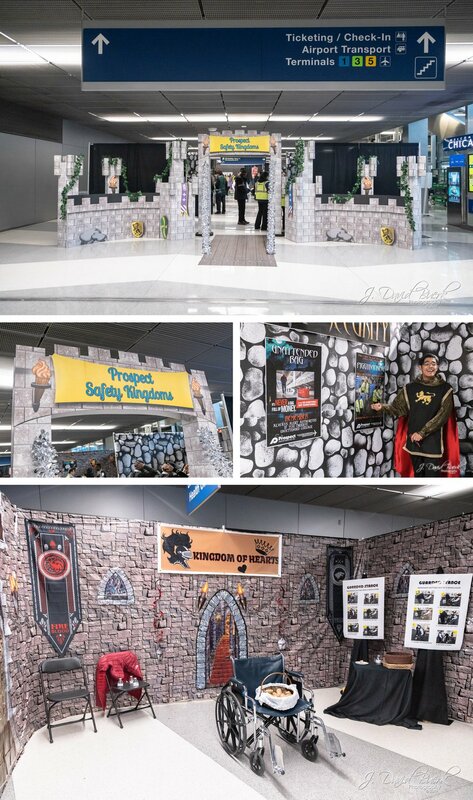 As I was retreating back to the hotel after a long morning trying to find a solution, I came across a curious gathering in O’Hare’s Terminal 2; as it turned out, I was there the same day as ORD’s annual Safety Fair. Or Faire as this should be called! Stations included airport security, wheelchair safety, and first aid, among others. Quite cleverly, the blood / spill cleanup practice station was a CPR dummy in a guillotine - Halloween, be still my heart! At this point, I’ve seen the majority of attractions Chicago is known for, outside of a Cubs game and its museums such as the Museum of Science and Industry and Adler Planetarium, all of which are on my list for future visits. This time around I wanted to do something different. My original plan was to rent a car to have it for dinner at Pequod's Pizza after my photoshoot (Pequod's isn’t feasibly accessible by train). The mishap with the photoshoot threw a wrench into that plan, because our Hail Mary plan was to try and get the required paperwork filed for the next morning - that plan of course didn’t work out either. I spent my Friday morning assessing my options, forming a plan to get the pictures I needed, and finally talk with my client (who is based in London, by the way) about the situation and how to proceed. Work is always first priority. Exhausted of options to get the pictures I needed for this trip, there was no other option but to begin organizing a reshoot upon returning home. Now I had the remainder of this day free, which meant I had the rest of the day to go for my plan to go explore nearby Milwaukee. Given the changes to my plans, this meant I had to rent the car that morning, rather than already have it and just be able to hit the road 1hr 20min North to Brewery City. No big deal; I just wouldn’t have as much time in the city as I’d originally expected. Seeing my options for rentals, I settled on a Mercedes-Benz CLA. The CLA has a reputation for being driven aggressively by… jerks… and although I’ve never liked the car from an outside perspective, I wanted to see if it there was a reason it caused this behavior to earn its reputation. First stop, however, was O’Hare’s new rental car facility, which was interesting because I’d already been to it in October, but without renting a car. My review of the CLA requires no more than a paragraph: I didn't like it. Not one bit. It felt cheap and plasticky, and the fact it was a baseline with only a panoramic roof that I couldn’t even use (because it was, ya know, 13ºF out, which incidentally is warmer than it was when I was here in December) didn’t help. The seats were comfortable, but were sport-styled single-piece-backed buckets that would be more at home in a boy-racer sport coupe than a car billed as entry-level luxury. Beyond the logo on the wheel and infotainment display, I honestly felt like I was in a glossy mid-2000s economy car; modern offerings from Mazda and Honda are simply nicer. Furthermore, I find it very interesting that Mercedes doesn’t list an MPG rating for the car on their website - I only drove the car from Chicago, to Milwaukee, and back, and had used over half the tank with interstate driving only. Remember, the CLA has a 208hp 2L I4 (with a 7 speed DCT that was very nice, I’ll add); I’m not sure where that much fuel went - my suspicion is its range suffers from its 13 gallon fuel tank. In conclusion, the body looks nice, but it’s poseur-luxury, that gets its impolite reputation from the owners, not any characteristic the car lends to the driver. I hope the Volvo is available next time. I may have missed the Polar Vortex by a week, but the effects were still there. Milwaukee River was now the Milwaukee Ice Rink, and all main roads had burns of not snow, but solid ice like curbs on each side. It was warmer this time than my last jaunt along Lake Michigan, but there was still a windchill of -7ºF. First stop was lunch. I had no plan for the day except find some local food for lunch, find some breweries to tour, and maybe find some cheese if I can. Arriving in the heart of downtown, I looked up some nearby restaurants to see what would appeal - Milwaukee Brat House sounded amazing, and I wasn’t wrong. Later in the day I’d find out my instincts were more than right - it’s a very highly-regarded German pub known of all over the city, with connections to the Milwaukee Brewers. 10/10 would recommend and return to. After lunch, I found a cheese boutique with samples of many of their offerings. Most of the selection was from Wisconsin, with some from other well known cheese regions including England and Italy. After sampling about half the cheeses on display that day, I picked up several Wisconsin cheeses, making sure one of them was cheese curds. Since getting back home, I’ve been asked if there is such thing as a cheese tasting, like a wine tasting. There actually is, and I’ve done it here in Virginia - I think it should be more common though. Pairings are just fascinating to me. And seriously; who doesn’t like cheese? Next stop was the MillerCoors Brewery. Unfortunately the last tour went out around the time I was arriving to Milwaukee about 2 hours prior, but they still gave me a beer tasting. Those of you who know me know I’m much more of a wine person. As for beer, I don’t dislike it, but I have to be in the right mood for it, and I generally only like dark beers such as porters or stouts, or smooth and balanced beers like red ales and lagers. I do not like IPAs, and don’t understand their popularity. Coors is known for their light beers, which just taste like water to me, but the beertender did give me a Leinenkugel’s Snowdrift Vanilla Porter that I liked (didn’t I just say I like porters?). It’s a real shame I didn’t get to go on the tour, because I’ve been on the Anheuser-Busch brewery tour in St. Louis, and it was underwhelming; they only walk you around outside and point to buildings and pipes - you see none of the actual production. The Miller tour is reportedly much more comprehensive, and shows guests each step in their actual operating production line. Since Miller brewery didn’t work out like I’d hoped, next stop was a microbrewery that at least five people I’d met that day had recommended (including a few at Miller!). Over I went to Lakefront Brewery, with a ticket to the brewery tour already loaded in my Apple Wallet before I even got there. Now I got the tour of a lifetime. The brewery itself is quite small, but the personalities of the staff are huge - don’t miss this brewery if you ever go to Wisconsin! I won’t spoil it for you, but you’re in for some entertainment and audience participation on this tour. Even better if it’s your birthday! The brewery has a full-service restaurant specializing in German food and fish-fry, so naturally it was dinner time with some brews. There was a polka band scheduled to play that night, but they never took the stage for whatever reason. What was fascinating to me was that there were barrels from Catoctin Creek distillery all over the tasting room - I’ve been toCatoctin Creek; it’s just 30min from home for me. Speaking with the beertender about it, he told me that the owners use those barrels for small batches of owner-only beer. Very fascinating! I had a hankering for cheesecake, but the brewery only offered cookies and chocolates for desert - that just won’t do. On the recommendation of several brewery staff, I walked across the river to a local favorite pizza place. It was nothing like I expected - this place was more upscale (wine) tasting room than takeout pizza joint it seemed like from the outside. I wish I’d known about it before dinner at the brewery, because I would have preferred to go here for dinner instead. They were playing downtempo lounge and EDM tracks I have on my iPhone while I ate my tiramisu. The next morning was my flight - it felt really, really strange leaving a city 700 miles from home without the pictures I needed, the only reason I was there in the first place. It was a lot of fun and I got a lot of great pictures, but not the pictures I needed, which left me feeling empty as I waited for my plane to push back. I did make a friend though. My flight was half empty, and the person in the aisle seat was bringing a Mew home to a little girl. I made sure Mew was safely buckled in for departure. Chicago, from the air, at night, is just magical, as I expounded on in this previous post. In daylight I don’t expect such a display from this city, however this time I was in for a surprise. I’d seen the pictures of Chicago during the Polar Vortex the week prior; it looked like scenes straight from The Day After Tomorrow. It hadn’t registered, however, that I’d see some of it for myself. Temperatures were a much more livable 20ºF, but there was still a staggering amount of ice on the lake. When it finally registered what I was seeing below me, my jaw actually dropped. The pictures can give you some sense of scale, but they simply don’t do the size of the expanse of ice justice. I’ve never seen anything like it in my life. This flight also gave me a new view of Dulles’ airfield, and some of the nearby quarries, thanks to the approach we’d been placed on. Now that I’m back, it’s time to start planning when I’ll be going back!